It really wasn’t all that long ago that Berlin was a divided city, struggling with its identity, but when the Berlin Wall came down the city and its people discovered a new-found freedom that’s helped Berlin become a world city, a center for culture, architecture, the arts and nightlife, and a thoroughly enjoyable tourist destination. Visit Berlin today and you’ll find a city that has embraced modernity yet still kept hold of its historic past. Iconic and historic landmarks like the Brandenburg Gate stand proud, while across the city there’s a very eclectic mix of architecture from different periods over the last century including Fernsehturm (the TV Tower) and the reconstructed Charlottenburg Palace. 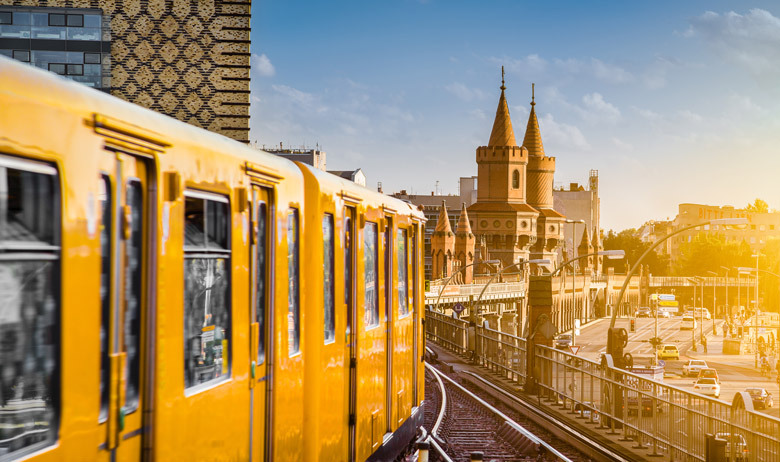 But you don’t just visit Berlin for the architecture and history; it’s a lively city with ample bars and chic restaurants, along with somewhere in the region of 200 clubs, making this one of the best cities in Europe for enjoying the club scene. Berlin was first mentioned in the 13th century and by 1417 it had become the capital of the Margraviate of Brandenburg. This was to be the first of several capital city titles that Berlin held throughout its history including the capital of the Kingdom of Prussia, the German Empire, the Weimar Republic, and the Third Reich until it became a divided city following World War 2. Split into East and West Berlin, East Berlin became the capital of East Germany and West Berlin became an exclave. Only after the Berlin Wall was torn down in 1989 and Germany became reunified the following year, did Berlin become the capital of Germany. Today it’s also the country’s largest city and one of the largest in Europe, but despite the millions of people who live here Berlin is a beautiful city that is one-third filled with parks and gardens, forests, lakes and rivers. Getting around this big city is relatively easy thanks to Berlin’s extensive public transport system. With lots of options for residents and visitors to choose from, car ownership in Berlin is surprisingly low for Western Europe. Visit Berlin and you can get around by ferries, buses, trams, U-Bahn and S-Bahn, or even use the city’s well developed bicycle lane system that includes around 620 km (385 miles) of bicycle paths. So what would be the highlights of a visit to Berlin? Well the Brandenburg Gate is definitely a highlight, and there are many museums and memorials in Berlin to choose from so you can pick those you’re most interested in. The remnants of the Berlin Wall and the memorial that’s now there is fascinating to see, especially if you’re old enough to remember the scenes on TV when they started to take the wall down. Berlin’s attractions aren’t just history related, there’s an excellent zoo to visit, and the iconic TV Tower should be on your list too. Whether you’re young or old, Berlin has something for all ages! The cultural, political and economic heart of Germany, Berlin pulses with history and to the beat of its infamous nightlife. Filled with architecture both new and old, this busy but leafy green city attracts visitors who are intrigued by its story. Discover its many museums and memorials, walk through its parks and gardens, admire the palaces and check out the club scene. Read on for our top 10 things to do in Berlin to find out more about this popular city.